Well, my friends, time has come for the nation’s president to be serious about U.S. Hispanics. Very serious. And that is why Barack Obama is taking a break from his busy schedule fixing AIG, Iraq, Afghanistan, Guantánamo and other stuff to come talk to us during tonight’s broadcast of Univision’s Premio lo Nuestro. This entry was posted in Marketing & Advertising, Television and tagged Barack Obama, Premios lo Nuestro, Univision. Bookmark the permalink. I heard at the press conference a few days ago Univision go the 3rd question! 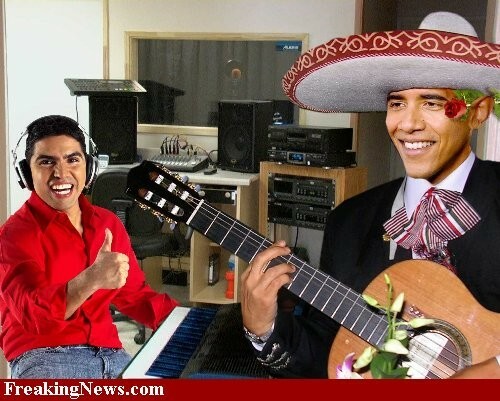 I’m so happy Obama is making an effort to help out the Hispanic community. Also, just a few days ago it was announced that Univision got higher ratings than NBC. Meanwhile, at Telemundo, “journalist” Maria Celeste Arraras continues her hourlong interviews with Myrka Dellano’s husband, because that matters! Yes, but can he play “La Negrita” on that guitar?